The garden of ‘Saturday’, named after the owners’ favourite day of the week, didn’t jump out at me at first glance. 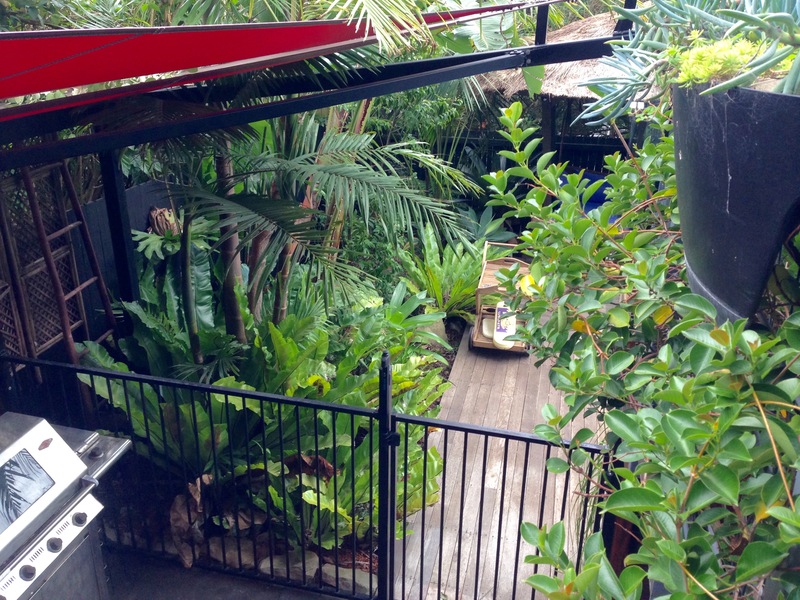 It was one of the nicer front gardens in the Balgowlah Heights neighbourhood and the eight-year-old house, which looked brand new, intrigued me, but I didn’t instantly find myself drooling, as I have been known to do on occasion. But this was a property that, by the end, I wanted to move in to tomorrow. 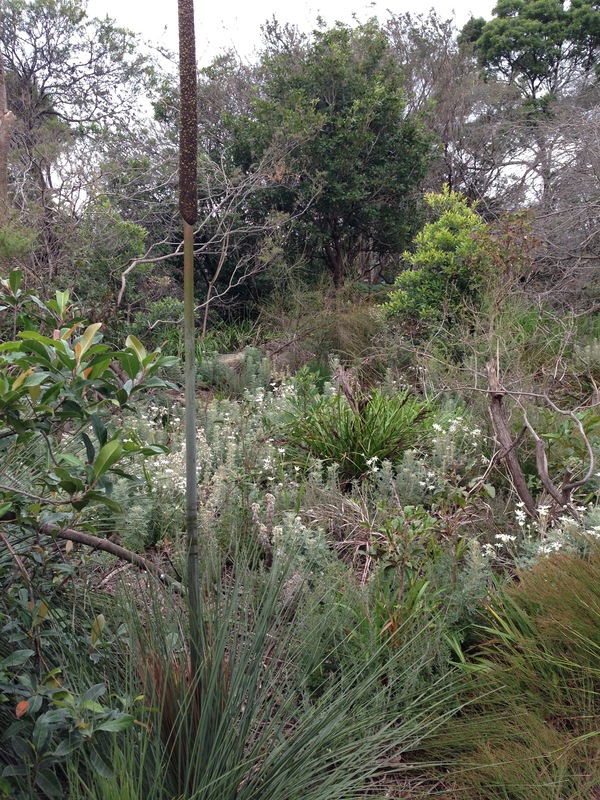 Approaching the property, at the start of winter, you see native bushland opposite, full of subtle flowering grass trees (Xanthorrhoea) and flannel flowers (Actinotus) and somewhat less subtle Banksia spinulosa. And standing within a row of 1960s bungalows, you find a somewhat different construction in front of you. David Burns and his wife, Tania, were very clear on what they wanted from their new home. 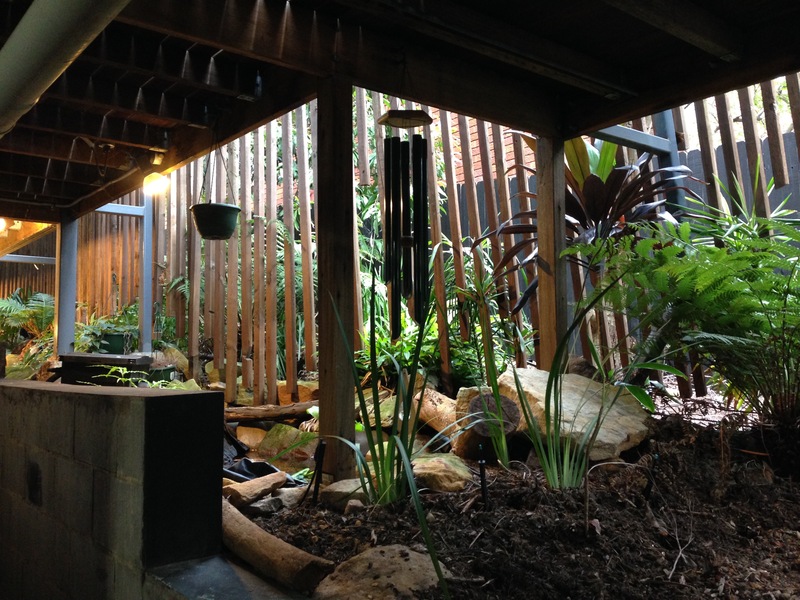 They specified the values that were important to them, from biodiversity, to energy and waste minimisation and water harvesting and with that, the architect was left to figure out the best way of achieving them all. You can see that it wasn’t a sunny day when I visited and yet the home was warm and inviting, despite David and Tania having had an overall credit on their gas and electricity bills for the last eight years. The hydronic underfloor heating, powered by solar panels on the roof, the solar chimney, pulling heat up from the ground floor in winter and out of carefully positioned ventilation in summer and the enormous eaves kept the house very efficiently and effectively temperature conditioned, year-round. Timber structure and ornamentation that had been recycled from the original house added a further sustainable feel to the home. One of the most charming elements of the property, was the genuine blurring between inside and outside. None of this ‘use a similar timber or tile for the floor material inside and out and you’re done’: this was full on blurring. The home was so nestled into its garden that you almost felt confused as to which side of the (mostly glass) walls you were on at any one time. Everywhere you looked, there were plants. 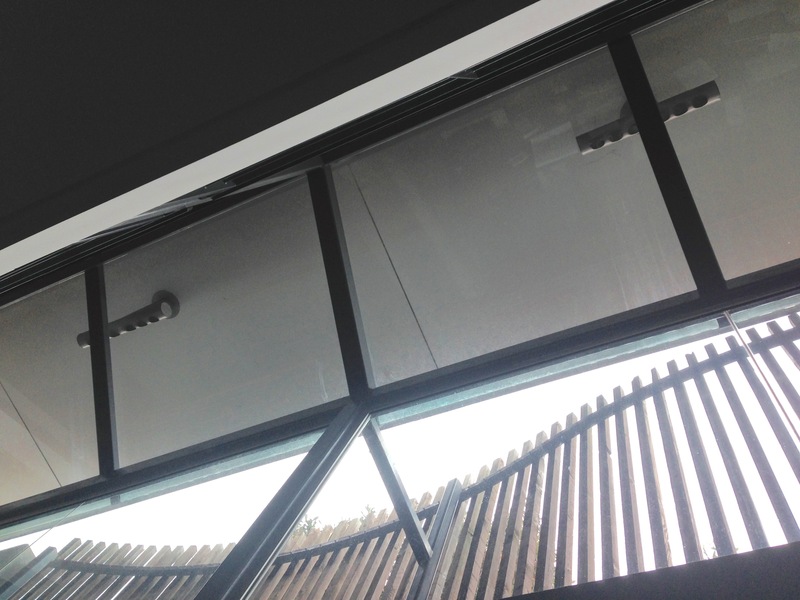 Rather than the greedy filling of the entire plot that so often happens with new builds today, David and Tania left four metre wide ‘bird corridors’ down either side of the building, leaving the house just six metres wide. Four metre wide bird corridors were created on either side of the house. 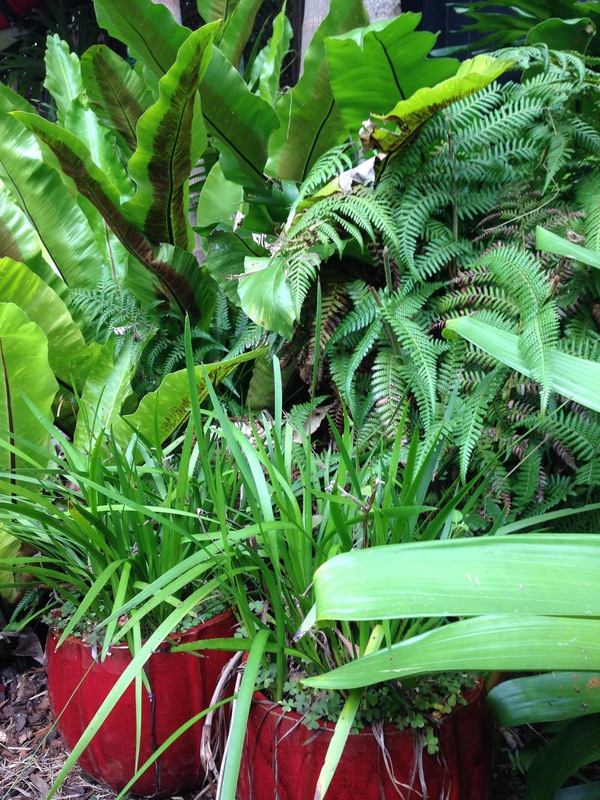 The gorgeous gymea lily (Doryanthes) in the left of the foreground. 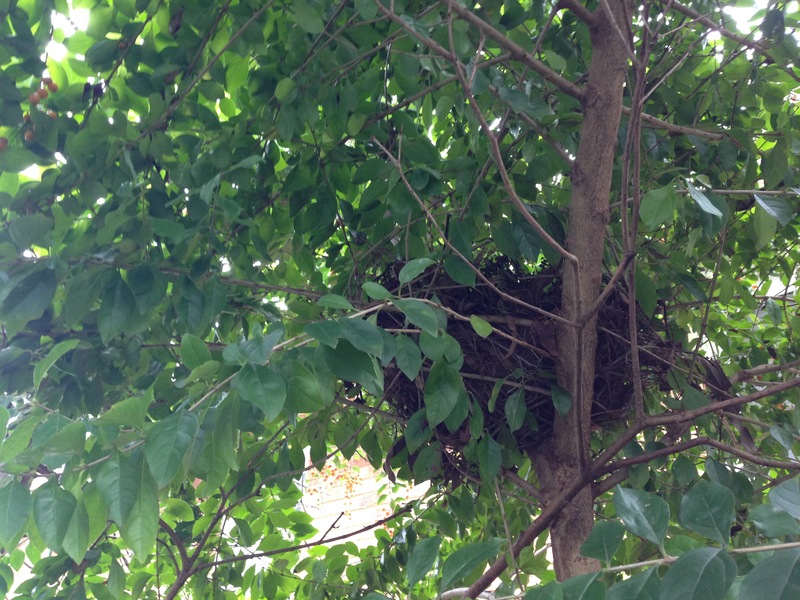 The result is that from every window you see layers of green foliage and not only does this encourage birds, but possums, bandicoots and frogs have made themselves homes here, too. The property had been mostly laid to concrete in its original form and so David and Tania had to build the soil up from scratch. They combined two parts crushed sandstone from a nearby building site with one part low phosphorus topsoil and, incredibly, the tube stock natives they planted thrived. 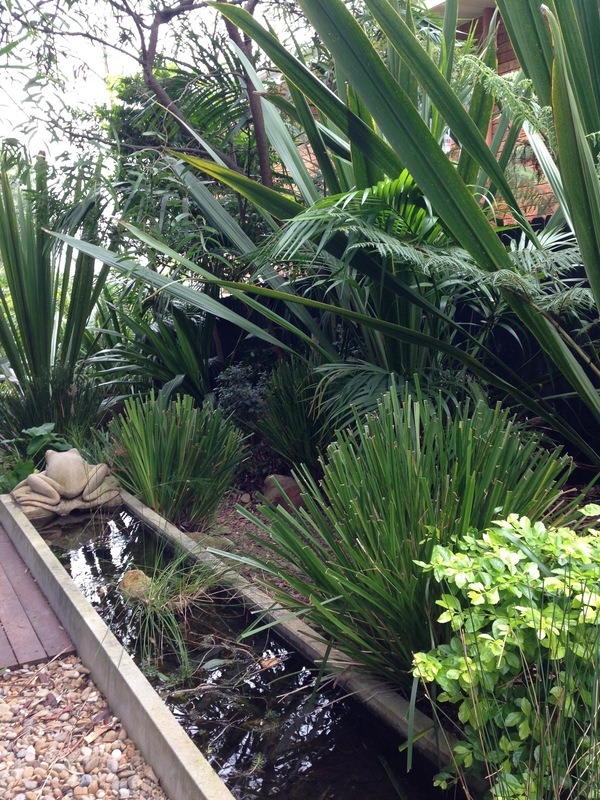 Over time, they have added to the garden and now have many exotics bringing complementary colours and textures to the natives. 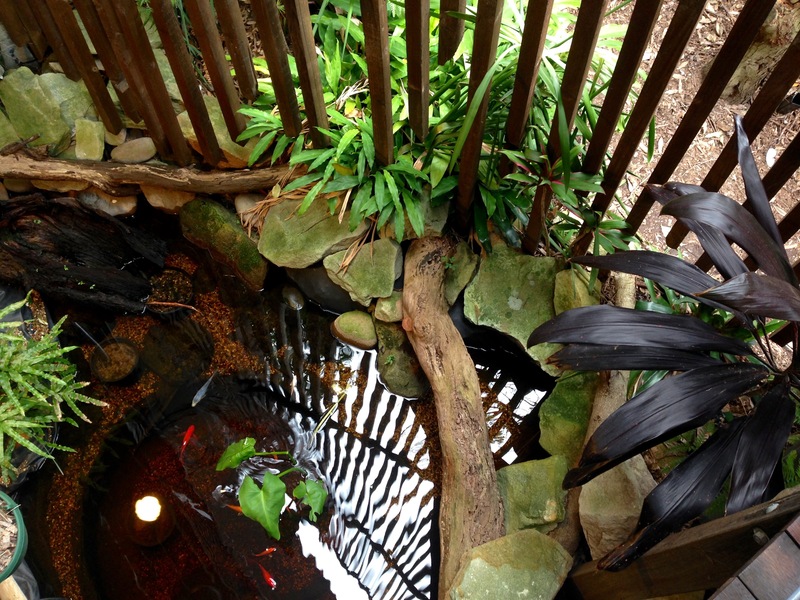 At the back, they are creating a more tropical feel around the pool, with broad leaved Asplenium ferns, Agave, Cordyline and Calathea. 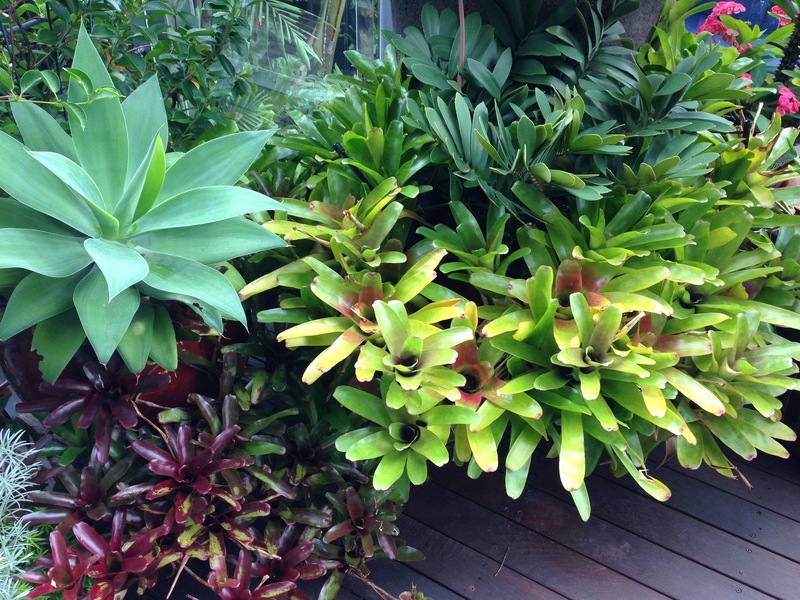 Even the terrace is full of beautiful plants. It was so delightful to see a corner so full you wouldn’t believe it was purely in pots, bringing colour and life right up to the family room. All the plants throughout the garden looked incredibly healthy; you wouldn’t believe the soil they started out in. The 20,000 litres of rainwater storage probably plays some part in this; I am convinced plants are much happier with rainwater than tap water. There were a few clever tricks in play with the water collection too. Swales were built throughout the garden to slow water down and let more of it soak in but the super sized eaves also collected much rain, channelling the water down the side windows to create a waterfall effect from inside the house, on its way to the tanks under the terrace. It was incredibly inspiring to see what can be achieved with a little thought. How nice it would be to live in a naturally ventilated house looking out on to birds and trees from every window, almost as though you lived in the garden. And all this for exactly the same price as a house with ducted air conditioning. Yes, I’d like to add a few more flowers and change bits here and there to make it my own. 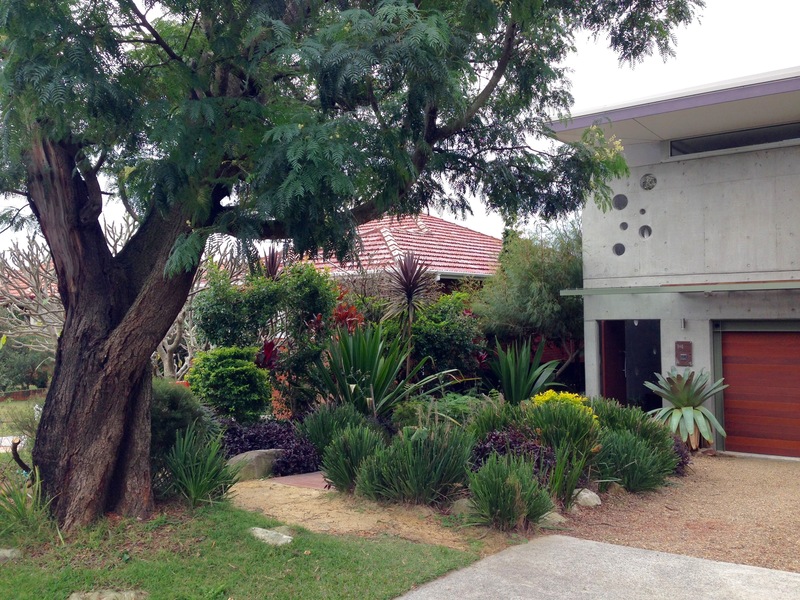 But there was no doubt, by the end, David and Tania had me in complete awe of what they had created: this is one of the most inspiring suburban properties I have ever seen and all on less than 600 square metres of land. Really quite remarkable. What a great garden. I really like the idea of someone actually shrinking the footprint of a new house for extra outdoor space. Finally!! It’s very refreshing, isn’t it? 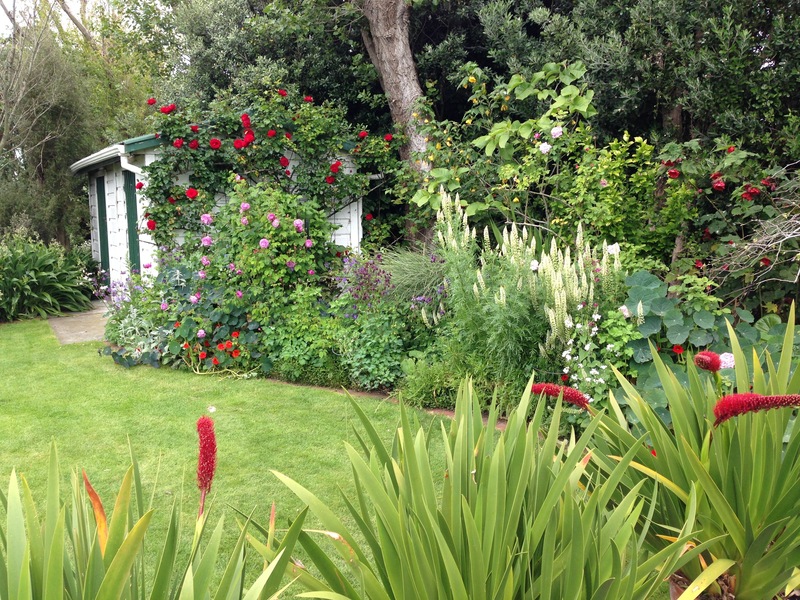 What a fabulous garden. The widlife corridors would also afford them a lot of privacy from neighbours. I have always wondered how you could live on a small block and still be private; this is certainly not apparent or possible in most new estates I see where as you suggest houses are wall to wall! This is inspiring to say the least and it could be include with a greater mix of plants to suit your taste and mine Janna! 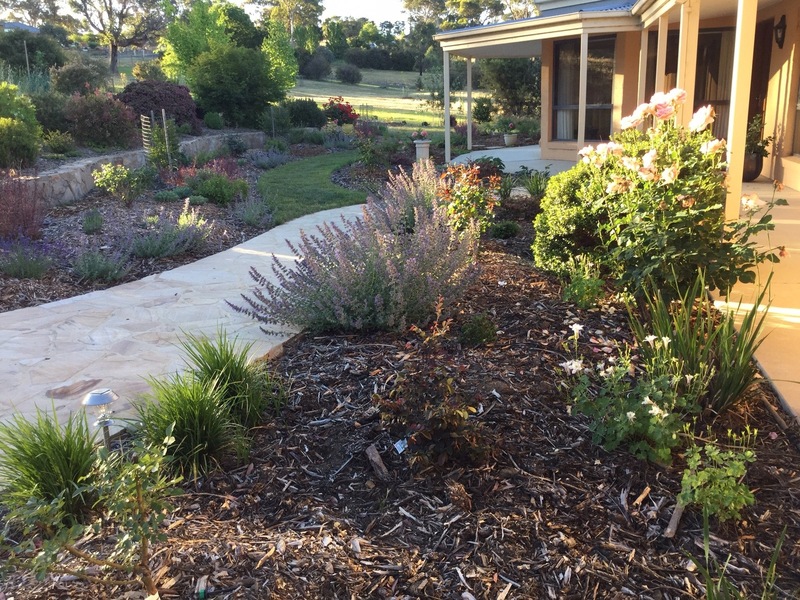 Also when I saw the photo of the park across the road, I immediately thought: “who says we can’t do naturalistic planting here in Australia with our native plants”. Was it as good as the photo Janna? The bushland was really beautiful. I imagine it may have been helped along a little over the years with a few plantings but it looks extremely natural. 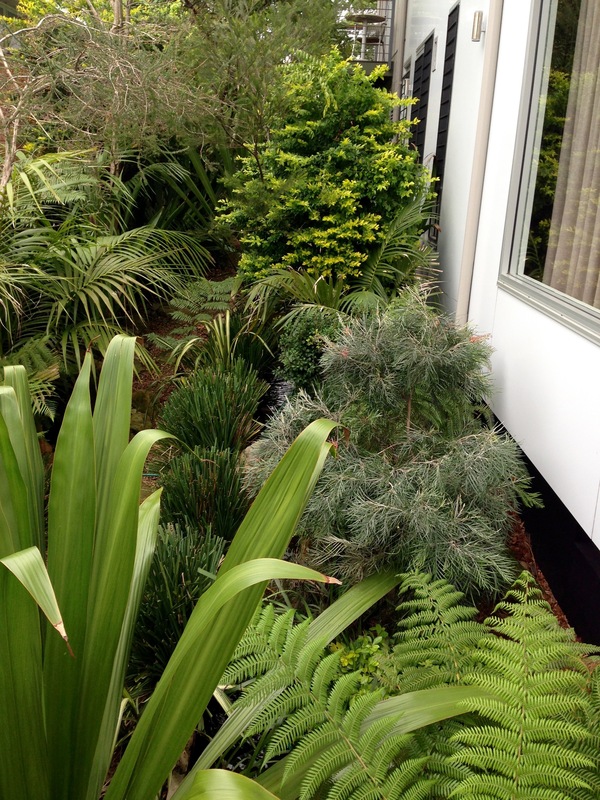 You are right, whilst I would want a naturalistic garden to look a little ‘neater’ than this, with a bit more intense interest, it does, absolutely, show that it is possible. People really are missing out if they don’t have much of a garden, aren’t they? I always wish my house was smaller and garden bigger but find it’s really hard to come across such properties, unless you build yourself. I left here so inspired though – that’s the only word for it. Very inspirational. For many in the US, big is still best, but there is a growing trend for smaller homes. Thanks Marian. Let’s hope that trend continues. I think Australia is similar to the US on the ‘big is best’ policy, but fingers crossed with energy costs rising and sustainability gaining momentum, things will start to change. It would be so much nicer for everyone. What a great find Janna! 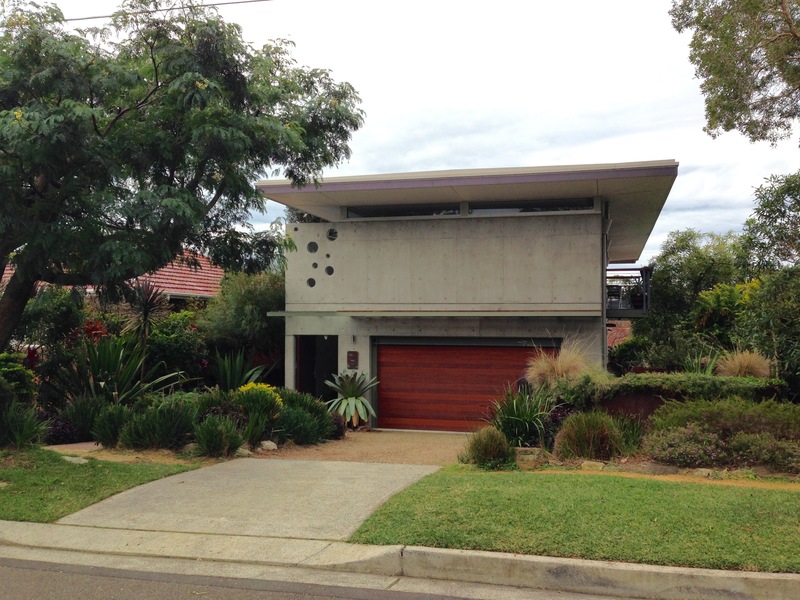 love the sense of the house nestled in the bush, but right now, in Sydney’s cold snap, I am seeking out a seat on my sunny lawn to warm me up and it doesn’t’ seem from your photos that there is anywhere to be out in the sunshine in this property- apart from the quite exposed front. DId I miss something? It is pretty cold at the moment, isn’t it? I’m craving sun too. Good spot on the photos, although in reality there were a number of very sunny seating areas in the north facing rear garden of ‘Saturday’. Curiously (or not), I seem to have succumbed to taking photos purely of the plants. I can’t help myself! Do you know who the architect was? It would be wonderful to see more responsible buildings constructed. Great suburban solution. Hi Erica. I’m sorry, I’m not aware of who the architect was. Isn’t it amazing what can be done though? It is so inspiring.